Robert Kliewer, emergency planning manager. When people see worrisome changes in their friends or colleagues, Robert Kliewer wants to help them find the assistance they need. It is this goal that drives the Violent Threat Risk Assessment training program (VTRA), which aims to help people identify behaviour changes in those around them that may indicate a deeper issue or possibly even harmful actions. "It's based off of worrisome behaviours. If you're witnessing behaviours that are concerning to you, what do you do with that information?" Kliewer said. "It's all about giving people the information of where to turn so that they understand that there are supports for them here on campus, and specifically who those people are." 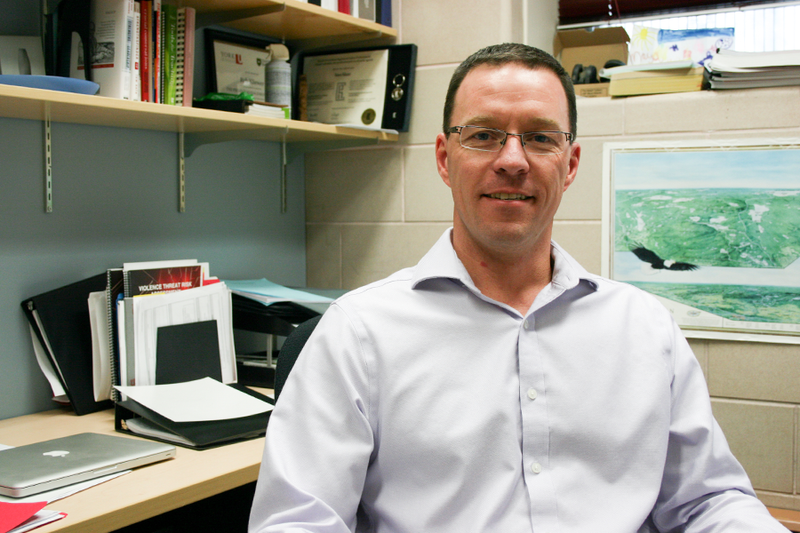 Kliewer is an emergency planning manager with University of Saskatchewan safety resources, where he is among the co-ordinators of VTRA. The program spreads awareness of mental health issues, possible indicators of personal distress and how to best connect those in need with the help they require—be it the support of friends, family or even professional psychological assistance. The program was first introduced to campus in 2013, when the Public Schools Board of Education and Greater Saskatoon Catholic Schools brought it to campus as part of a larger community push. While VTRA includes many Saskatoon and area partners, including Saskatoon Police Services, Saskatoon Fire Department and Saskatoon Health Region, Kliewer said it is one small part of a larger mental health initiative that spreads well beyond the city's borders. "It's not just a university initiative; it's a nation-wide community approach to addressing, proactively, these types of issues," he said. Though VTRA does offer 25-minute presentations every six months on some easily identifiable worrisome behaviours— including uttering threats, substance abuse and anti-social conduct, among others—Kliewer stressed that the program is less about training people to diligently report others than it is to encourage peers to help each other. "It's more of a supportive approach than, say, a watchful eye. The goal is: ‘Hey, someone's got an issue going on; we've identified a type of behaviour that's not typical for them. How do we support them?'" he said. "It's prevention of violence, and coming up with a good intervention plan to support that person." Kliewer said that younger people on campus, such as students, are often already quite good at identifying worrisome behaviour and encouraging each other to seek help through their friends, family, other loved ones or professional channels. However, he continued, part of what VTRA is striving to do is persuade older generations to act similarly. "Now that there's actually a process and people trained in support, we need to really get that out there and change the culture and change the mindset of our long-term faculty and staff," he said, adding that this change can be monumental for some. "We're asking people to do something here that they've never been asked to do before: share information, share worrisome behaviours that people are identifying. That's a huge thing to ask people."